The West Coast Cup is a family affair. 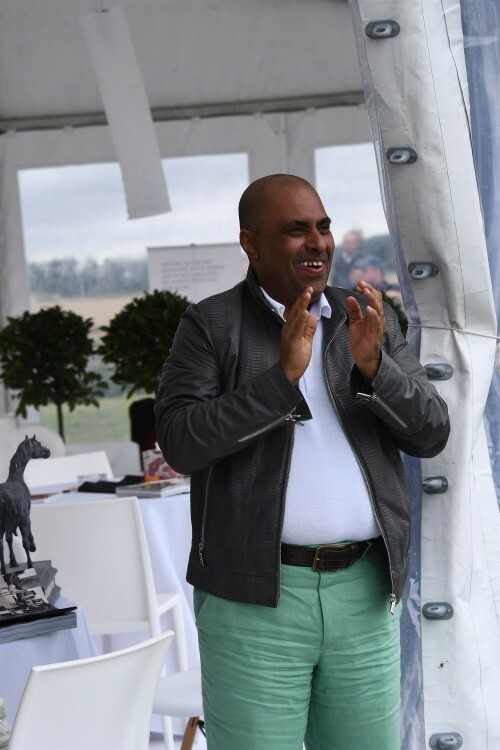 The Detailleur family welcomes Arabian horse lovers from all over the world to this international event held in the scenic Belgian town of Koksijde, near the coastline with the North Sea. 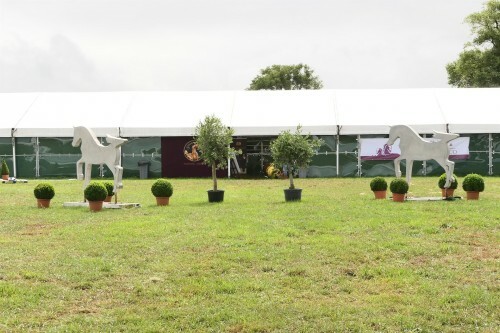 With its international panel of judges and horses competing from all over Europe and the Middle East, the West Coast Cup remains a popular event for the many that have visited. The people present at this lovely event with its relaxed atmosphere were not disappointed. Next to the standard halter classes, a Straight Egyptian show, and a dog race the show offered a special show act: Lorenzo The Flying Frenchman. 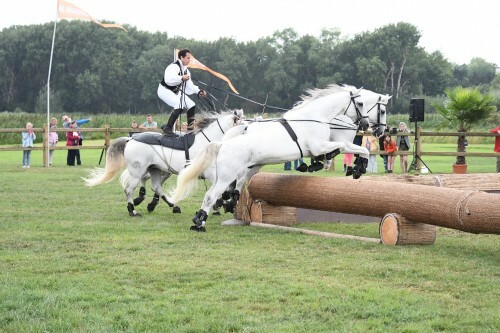 His performances are truly unique, such as his stand-up dressage, which has its origin in Hungary: four pairs of horses - one behind the other - with whom he jumps impressively over obstacles at full gallop. Only in his early thirties, Lorenzo can already look back over a career that spans a period of more than twenty years. He is still young and yet so full of life, which proves what a person with courage, willpower and strength of purpose can achieve. In addition, there was a chance for the best European bred and owned mare to win a breeding by the one and only RFI Farid. 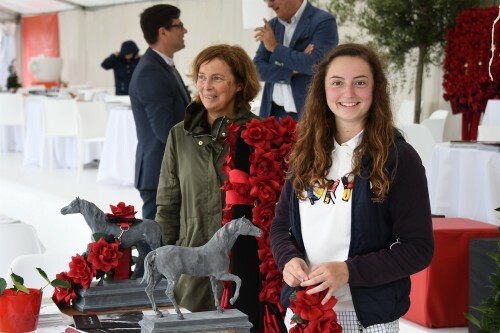 It was the grey Fer Tesoro daughter Celia Del Sur, bred by Maria Del Carmen Perez Sanches Ganaderia, Spain, and owned by Julie Kennedy and Emma Maxwell, UK, who won this breeding. But it was Michalow bred Galerida, who went away as the Best In Show after winning Unanimous Gold Champion Senior Mare and dominating strong competitors like D Ibn Rasheem (who was named Best In Show in Vichy the weekend before and was awarded Unanimous Gold Champion Yearling Colt at this show), D Wasayef (Gold Champion Yearling Filly) or Bint Seduction HB (Unanimous Gold Champion Junior Filly). The 2013 born Shanghai EA daughter Galerida is proudly owned by Al Baydaa Stud, Egypt, which adds valuable Polish lines to its breeding program. Galerida is no newcomer to the show ring; she has been 2014 Bialka Spring Show Yearling Gold Champion Filly and 2015 Bialka Spring Show Silver Champion Junior Champion Mare. Galerida’s dam is the 2005 Polish National Champion Mare and 2005 World Champion Mare Galilea by Laheeb out of the wonderful Monogramm daughter Georgia and tracing back to Gazella db. Our warmest “thank you” goes to the Detailleur family for the great time at the West Coast Cup. Their hospitality was much appreciated by everyone present. We congratulate all of the champions (see all results here)! We also say thank you to all of the show sponsors for their much-appreciated support of this show. Enjoy show photos and atmosphere shots of the West Coast Cup here.